Precision Stainless Beaker Baskets - EnviroSense, Inc. Stainless beaker baskets. 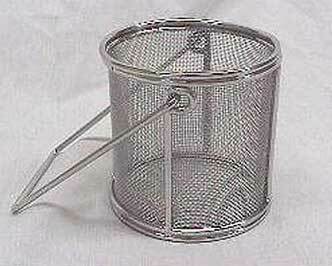 A perfect basket for cleaning small parts in a beaker or small ultrasonic unit. 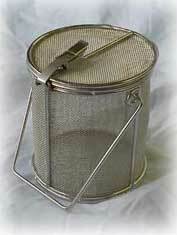 Baskets are constructed with 1/8" diameter rod with #24 mesh. #24 mesh has an .027" opening. Handle is removable to allow baskets to be easily stored. Each basket is buffed and electropolished to enhance corrosive resistance. Baskets will accept an optional latching lid. © 2001 - 2019 EnviroSense, Inc. All Rights Reserved.